Busan KAPCA and KAWA went to the Ulsan Southern District Office to hold a press conference urging the District Office to appeal the Ulsan Prosecutor’s decision not to charge the slaughterhouse owner and the worker. However, they were shocked and appalled to learn that the appeal deadline is already over. The District Office workers have intentionally kept this information about the appeal period a secret in order to ignore this issue. 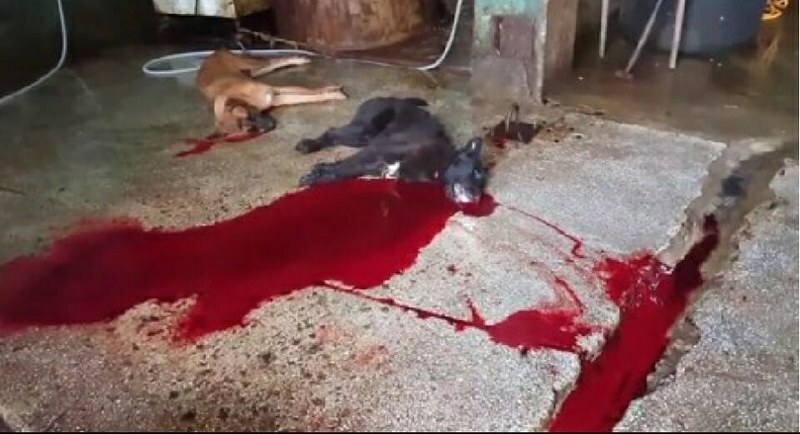 It was a very emotional and difficult day for all the members of these organizations and especially for the Busan KAPCA Ulsan member who carried out the raid on this slaughterhouse, and witnessed the horrific scenes. Korean activists are up against not only the dog meat industry but their own Government, which is profoundly indifferent to the suffering of these animals. These activists need our support in bringing this shame to the world and putting pressure on their shameful Government. Click HERE to read about this case. 오늘 부산동물학대방지연합 회원님들과 동물자유연대부산지부, 울산의 개인 활동회원님들 30여명이 모여 울산 남구청앞에서 항고촉구를 위한 기자회견을 하러 갔습니다. 현장에 도착해서 들은 충격적인 이야기. 남구청에서는 처음부터 항고할 생각이 없었고 처벌 당시 항고해달라는 저희 단체의 요청을 수용하는 척하다가 항고기간이 끝날 때쯤 일방적으로 불가통보를 한 것입니다.남구청은 이제 와서 항고하겠다고 말을 한적 없다고 잡아뗴고 있습니다. 그야말로 동물보호는 안중에도 없고 행정편의만을 생각하는 공무원들이 시민의 뒷통수를 친 것입니다. 오늘 기자회견에서는 무혐의와 기소유예 처분의 가벼운 판결에 항의하고 특히나 항고를 포기한 남구청에 대한 항의 기자회견문을 낭독했습니다. 항고촉구를 하러 갔으나 항고기간이 넘어갔다는 얘기에 모이신 분들 모두 분노의 목소리를 높이셨습니다. 현장에서 단속에 참여하셨던 저희 부산동학방 울산팀장님께서는 현장 당시의 상황을 얘기하시면 그 잔인함과 참담함에 눈물까지 흘리셨습니다. 기자회견 후 오신 분들 모두 가지 않으시고 남구청장실로 항의를 하러 갔으나 일정이 잡혀있다고 하여 담당자들을 만나 고발장을 보고 항고포기에 대한 강력한 항의를 하였습니다. 그러나 이미 항고기간이 지나버린 상황이라 그야말로 무슨 이런 황당한 경우가 있나 하여 모두들 허탈하면서도 분노를 참을 수가 없었습니다. 개식용을 하는 이나라에서 결국 이런 판결은 미개한 의식수준이 공직사회에 얼마나 깊숙히 뿌리박혀 있는것인가를 여실히 보여주고 있는 대목인것입니다. 또한 우리가 더욱 더 노력해야하는 이유이기도 합니다. 남구청에서는 지속적인 단속을 하겠다는 약속을 하였으나 이것만으로 만족할 수 없어 현재 다른 방법도 알아보고 있는 중입니다. 여러분들은 울산남구청과 시청에 적극적으로 항의해주시고 또한 계속 관심가져주시기 부탁드립니다. 억울하게 죽어간 생명들에 대한 분노의 마음을 금할 길 없는 날입니다. 오늘 기자회견에는 울산mbc를 비롯해 여러 매체에서 취재를 나오셔서 끝까지 해주셨습니다. 감사드립니다. 오늘 부산동물학대방지연합 뿐만 아니라 울산활동가님들, 애기까지 안고 와주신 분들, 그리고 멀리서 마음을 보태주고 계신 모든 분들께 감사드립니다. 현실은 이럴지라도 절대 지치지 말고 더욱더 앞으로 나아가야합니다. Write to the below Ulsan government. I am no longer accepting things I cannot change, I am changing things I cannot accept! We are all born with compassion RECLAIM YOURS! He who passively accepts evil is as much involved in it as he who helps to perpetrate it. He who accepts evil without protesting against it is really cooperating with it. – Martin Luther King, Jr.
“Stand still, close your eyes and listen; in the silence you can hear the cries of pain and low moans of anguish of animals waiting to die… do everything you can even if today it is just one small thing.